This is DIY Homefit's test and development website - please do not buy from it. Please click here to go to diyhomefit.co.uk. As with all timber based items our products should not be stored or installed in a newly plastered room or damp environment. If you need to store them for a while they should be kept flat, preferably in the room in which they are to be installed. This is of particular importance for tall/wardrobe doors. To clean door surfaces use a soft clean cloth, damped (not wet) with warm soapy water. Dry off with a soft dry cloth. Do not use aggressive cleaning liquids or such items as scouring pads. Never use an appliance that generates high levels of heat or concentrated steam (such as a toaster, kettle, pressure cooker or breadmaker) directly under or adjacent to a door or panel as this can cause damage. Components damaged as a result of not following the above guidelines are not covered by the guarantee unless protected by suitable heat strips and a suitable gap left for heat escape. The correct care should help ensure that your doors and associated products will look good for a long time. To clean the surface of the doors, wipe using a soft cloth with a mild non-abrasive, dishwashing detergent diluted in warm water. The mix should be 1 part detergent to 99 parts warm water. You should never use any vinegar-based detergents, solvents, abrasive detergents, white spirit or furniture polish. 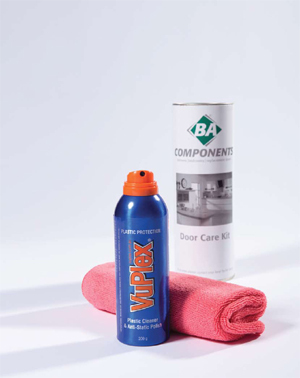 We recommend the use of VuPlex polish with a micro anti-scratch cloth, as included in the Door Care Kit. Laminate worktops are generally easy to clean, just use a soft clean cloth and warm soapy water. Stubborn marks can often be removed with a cream cleaner but you should never use agressive cleaners or abrasive scouring pads as these will damage the surface. Laminate has good stain resistance and is unaffected by most foods, domestic cleaners, cosmetics and solvents. Foods with strong colours such as curry, beetroot, blackcurrant juice, red wine and strong acid-based cleaning or de-scaling products will stain the surface and should be wiped away immediately. Residual stains left after wiping can usually be removed by cleaning with a mild bleach solution, as can ingrained stains in textured laminates - use a nylon bristle nailbrush if necessary on these - be sure to rinse off and dry the area immediately, bleach lying on the worktop may soften the laminate and cause damage or discolouration. Wipe up any spills immediately and pay particular attention to drying thoroughly around the sink and over any joints; no matter how good the seals water can often find the slightest weaknesses. Also please be careful not to place kettles, toasters or any other appliances that get hot in the immediate area of a joint or directly over it. Over time the rapid changes in temperature can cause the joint seal to break down and allow moisture to get in and damage the chipboard core of the worktop. Typically this can cause the core to swell up and the laminate to become loose. You should always protect your new worktop from hot pots, utensils etc. by using heat resistant trivets or surface protectors. Never take anything out of the oven or off the hob and place it directly on the surface of the worktop. Boiling water and cooking splashes will not harm your worktops, but should be wiped off as soon as possible. Your new worktops will withstand normal domestic use for many years to come, but you should always use chopping boards, bread boards etc. and never cut directly onto the surface. Also take care not to slide cast-iron pots or un-glazed crockery over the surface as this will cause unnecessary wear. Cuts and scratches will be more visible on gloss, metal foil and darker laminate surfaces. 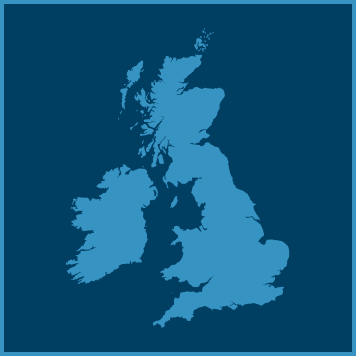 Given proper care and attention your worktops will last for many years. Visitors welcome - appointments only please.